Where are you plugged in? Is it your local church? The world? Do you depend on His source of power or your own? Are you using someone else’s power to get to God? Psalm 147:5 Great is our Lord, and of great power: his understanding is infinite. When we come to the realization that God is the only power source to this whole world, it makes it easier to want to get plugged in. When we recognize His living power in our lives we begin to have this desire to follow everything towards the power source. We are drawn to the truth of His power. As our hearts turn towards Him, we begin to build up this desire to have that same power work in our lives. We begin to see that the power of the world is actually powerless in our lives. We soon see that He is the only way to life and living abundantly in this fallen world. How strong is your power source? Is your power from God or man? Do you trust in the power source you are connected to? 2 Corinthians 13:14 For He was crucified in weakness; but lives by the power of God. For we also are weak in him, but in dealing with you (the Holy Spirit) we live with Him by the power of God. Once we find ourselves plugged into the main power source we can flow in peace. We become a conductor of His power. What a privilege to be a channel of His power and grace. As our light begins to shine with His power working through us we can begin to lead others to get connected. They will want to begin to want to tap into the same source of power because they see we walk in peace. The more we bring to the power source of God, the brighter a light we can all shine for Jesus. One warning I might give at this point is to not get extended into the main grid of God’s power. Don’t try to get to God by plugging into someone else’s walk. God has a walk already planned out for you and though He may use you in someone else’s ministry, He still desires for you to be plugged in on your own separate line. I feel the purpose of this is to keep you focused on Him and not the person running a ministry. God wants to feed us on a direct line so as not to begin a game of telephone so to speak. He desires to speak directly to us so that we get all of what He is trying to say to us, not a watered down version of the message. Are you over plugged? Do you have too many connections? Are there any short circuits in your connection? Do you have a quick disconnect? Is there an on and off switch or a steady stream of constant power? Do you feel as though your light is not big enough? Luke 10:19 Behold, I give unto you the power to tread on serpents and scorpions, and over all the power of the enemy: and nothing shall by any means hurt you. Romans 13:1 Let every soul be subject unto the higher powers. For there is no power but God: the powers that be are ordained by God. 1 Corinthians 2:5 That your faith should not stand in the wisdom of men, but in the power of God. What causes us to disconnect from the main power source? Sometimes we get distracted by other things. We might start slacking on our daily devotions or maybe skip a worship service or two. Then we feel as though we are not worthy to plug in and we might just allow others around us do all the glowing for Jesus. Perhaps we feel like we are not doing our best to shine or that our light is not big enough or bright enough when in reality, we are all plugged into the same power source…yes I said the SAME power source. No one is unequal in the Kingdom of God. God will use us as He already purposed for our lives even before we were born. Each light is important and it contributes to the Kingdom as a whole. I encourage each of us to stay plugged in. 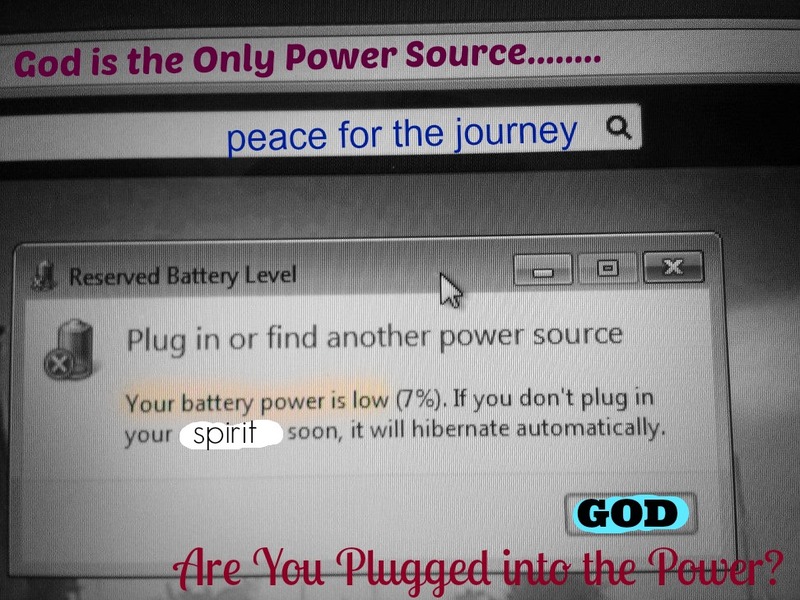 Stay connected to the main power grid of God and not piggybacked off of someone else. Be who you are in Christ and let your light shine. Don’t get short circuited by trying to be plugged in all over the place. Go where He says to go. Listen to His still small voice and stay plugged in to Jesus. Together we can be a lighthouse to a world of hurting and hopeless people.